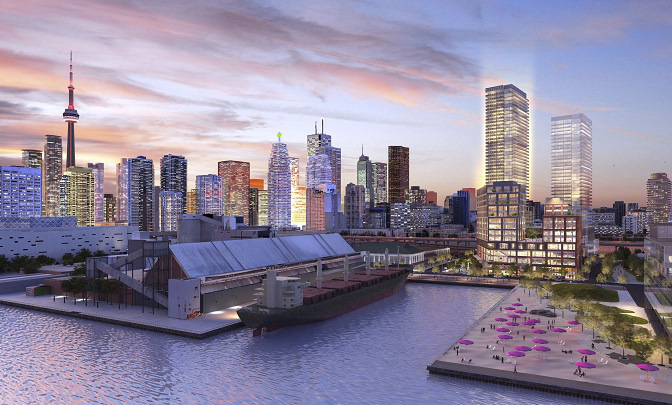 "Developer Daniels Corporation has unveiled its plan for a mixed-use condo project at the site of the former Guvernment nightclub in Toronto’s waterfront district. Daniels purchased the location at Jarvis and Queens Quay last May with plans to build a 1,320,000 square foot “live-work-play-learn-create” community. This dynamic new community, at the gateway to East Bayfront, will become a fully connected destination that will enhance Toronto’s position as an internationally recognized city of arts, culture and innovation,” the company said in a media release. The development project will include office space, retail, residential, academic and cultural components with a price tag of $700-million. The complex will also be home to some of the city’s leading non-profit arts organizations such as Artscape, Manifesto, The Remix Project, talent management firm Last Gang Entertainment and entertainment law firm Taylor Klein Oballa LLP. Phase one of the project includes building a tower on the north parcel land to house Daniels’ headquarters as well as a “creative industries hub” and retail space for a RBC bank, stores, restaurants and coffee shops. Phase two will include a 48-storey tower located on the south parcel land with 900 condo suites. The developer is also negotiating with George Brown College and OCAD University for a centre for innovation."